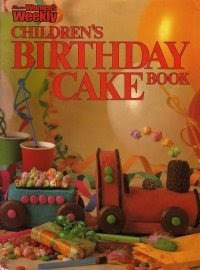 When I was a kid my favourite book (apart from the Famous Five books and all the Usborne Puzzle Adventures) was the Australian Women's Weekly Children's Birthday Cake Book. I would spend hours reading it like it was a picture book, fantasising about which cake I should beg Mum to make me on my next birthday. I had very firm opinions regarding the cakes featured in the book: the Candle cake was too boring, I loved the Bunny Rabbit and Robert Robot cakes, I didn't like the ice cream cakes, and was simultaneously repulsed yet fascinated by the concept of the Swimming Pool cake featuring plastic dolls with jube swimrings swimming in GREEN JELLY under the shade of a snazzy cocktail umbrella. With the notable exception of the Candy Castle (which Mum made me for my sixth birthday when we were living in London - those British kids had never seen anything like it! ), I thought the cakes "For Boys" were much cooler than the cakes "For Girls" - who wants a freaking Sewing Machine or Maypole/Ballerina cake when you could have a Rocketship or a Tip Truck laden with lollies?! 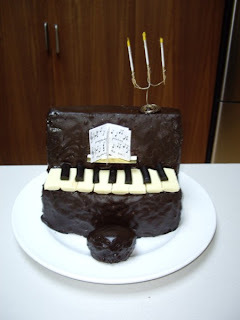 In January this year I was talking with my friend C about childhood memories and I mentioned how I'd always wanted the Piano cake from the AWWCBCB. Wonderful wonderful friend that she is, she showed up at my (ahem) 27th birthday party a few weeks later carrying the cake you see on your right, complete with a handmade candelabra (which still sits proudly on my mantelpiece) and miniature bound sheet music to Rock Lobster. So fast-forward to May this year when I jumped on the facebook bandwagon. Having joined a few food-related facebook groups such as the excellent "top melbourne restaurants" (lots of good recommendations!) and "I wish Yum Cha trolleys would circulate through my place of work", I created a group called "The Women's Weekly Birthday Cake Book is awesome" and invited C and a few of my friends to join it for a bit of a laugh, thinking the whole thing would fizzle out after a week or two. But lo and behold, I hadn't realised that the book had struck a chord with so many people! Gradually, more and more people, almost all of whom I don't know, started joining the group... 50..... 150... 500... and today the group reached 1000 members! In honour of that milestone I thought I'd blog about the group here today. Popular topics in the group have been Choo-Choo Train envy (the train, pictured on the cover, looks the most difficult to make of all the cakes, so is therefore the most coveted), the merits of the updated version of the book (featuring a Magic Toadstool cake on the cover) versus the original, and of course the love-hate relationship we all have with the Rubber Ducky cake (pictured left), with his bizarre popcorn afro, scary eyeliner and salty chip beak. What I really like about the group is that as well as sharing their birthday cake memories, people have been posting photos of their AWW-inspired cakes, both from their childhoods and from the present (including one member who posted a photo of two little boys posing with the train cake in the mid 80s, then posted a present-day photo which recreated the original, featuring the same two boys (now grown) and a new train cake!). The group has over 75 photos that have been sent in! I thought it best not to post other members' photos here on my blog without permission, so these are photos of cakes my brother and I were lucky enough to have made for us by Mum in the 1980s (and yes, Buster loved the Cricket Pitch cake he had for his sixth birthday SO MUCH that he had it again for his eighth birthday). But if you're on facebook, drop by the group and check out the other photos, they're very cute! I have inherited my family's copy of this book and made a couple of the cakes for Michael's birthdays. I did actually make the train cake once (with only one trailer) and the stress of it has prevented me from attempting any more of these - be warned!!! 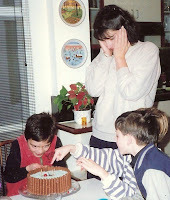 Man, I wish I was lucky enough to have birthday cakes like that when I was a kid. My Mum was a cooking expert not a baker and used to give Chinese cooking lessons in shopping centres. wow that looks great... touched a chord no doubt. 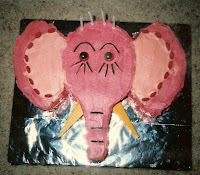 i have fond memories of the book even though i'm not sure i ever got any of the cakes. many friends still inspired by it. it makes me want to break my facebook ban to join. and your david and camy's group.... sigh. but i must stay strong. ps. 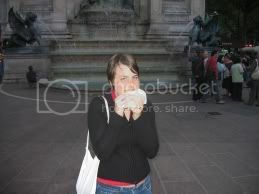 great blog... it's so exciting to visit again and it's making me hungry! Hi Gem! Copies of the original book crop up quite often on eBay - that's where my cousin was able to purchase it. Happy hunting! Consider putting the book cover as the facebook group photo! I stumbled upon the group (and then the link to this article) by chance, and almost clicked away, until i saw the duck cake photo in the posted items and suddenly remembered this wonderful book! I just dug mine up from my moms recipe cupboard! My Mum made me a sewing machine birthday cake and I loved it!!! Everything in that book is pure genius! Yes, even the girl section!! Natalie, are you sure you can't see the album? Cos if you've successfully joined the group I can't think of any good reason why you wouldn't be able to see the photos (you need to scroll down past the comments on the wall to see the photos). You were so lucky to get the castle! That was my dream. Year in, year out I got the swimming pool cake, mum reusing the same figurines and cocktail umbrellas each year. I actually thought the jelly/cake combination was excellent. For my 27th birthday party on the weekend, I had a "27 going on 7" party and made the Pirate cake ship from the new Women's Weekly. I must say I rate the new book too, but maybe not as much. 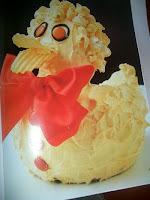 Agreed that popcorn duck looks gross. How funny, I just had my 27-going-on 7 party on the weekend, and made the Pirate Cake from the new book, which isn't quite as good as the original but it was a cool cake (I couldn't get the old book in time). I'm jealous you got the castle! 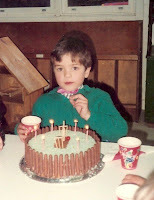 I got the swimming pool every year, but always thought the jelly/cake combo was pretty great. I too got freaked out by the duck - chips and popcorn not right. We always wanted the dump truck as it meant you got a whole lot of lollies which we were never allowed!